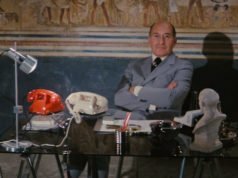 In A View to a Kill, Sir Godfrey Tibbett, like Bond, wears the morning suit variation of morning dress where the morning coat, waistcoat and trousers match each other. 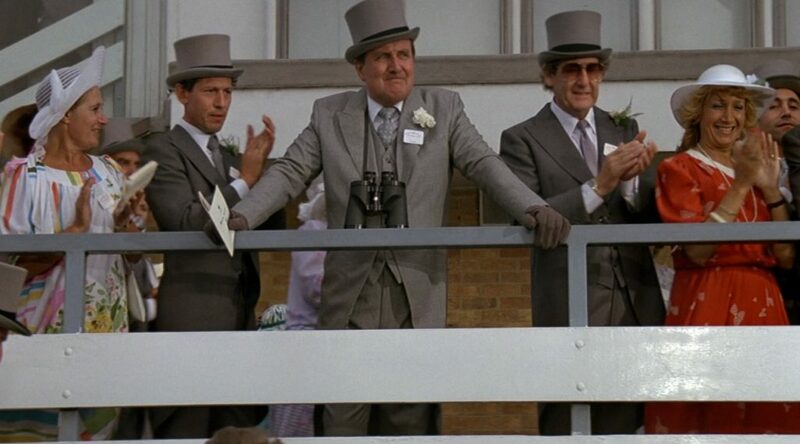 Tibbett is played by Patrick Macnee, who is best-known for playing the dandy John Steed in The Avengers, and Macnee still looks effortlessly stylish as Tibbett. Tibbett’s suit is light grey, woven of grey and white yarns, and it could possibly be pick-and-pick. Light grey is the classic shade for the morning suit, more so than the much darker grey that Bond’s morning suit is. The morning suit is less formal than non-matching morning dress, and it’s best worn for less formal occasions. Royal Ascot is thus the ideal place to wear a morning suit. The morning suit’s coat is cut and detailed the same as the more traditional black morning coat. It is a body coat with a waist seam for a close fit, and it is cut away in the front skirt below the button and curves around to the tails in back. Tibbett’s morning coat has the traditional single button link closure and peaked lapels, and it is cut with a clean chest and straight shoulders. It has three buttons on the cuffs and a breast pocket. The single-breasted waistcoat has six buttons—the bottom is left open—and no lapels. The buttons on the morning coat and the waistcoat are polished grey horn. 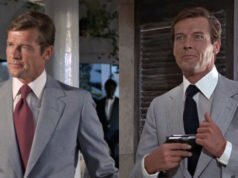 Tibbett’s white shirt is a regular formal shirt with a spread collar and—like on M’s shirt with morning dress—button cuffs. Button cuffs don’t belong with morning dress, and some would argue that attached soft collars don’t belong with morning dress either. At least Tibbett’s wider spread collar is more formal than the narrower point collars that M and Q wear. Tibbett a grey and white printed spitalfields tie, and it is tied in a windsor knot. He wears the same light grey felt top hat with a black ribbon and white carnation in his lapel that the other men wear, but his brown, unlined suede gloves are an interesting change. Sir Godfrey Tibbett’s morning suit concludes this series on morning dress. 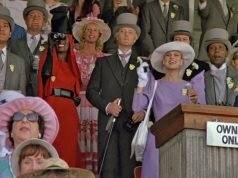 I’ll write about Zorin’s charcoal grey herringbone morning suit at a later date. Sir Godfrey’s morning suit looks very much like the one I’ve seen photographs of my grandfather wearing at Royal Ascot in the early 1980’s. I wish he still had it! I don’t want to criticize for free, but looking at the first picture, doesn’t the waistcoat seem way too low on the trousers (like the man on his left as a matter of fact), since it’s supposed to “end” approximately at the place of the working button of the morning coat , like on Q ? Strange to see this mistake on Patrick Macnee. Perhaps the vest is just too long for him and for his height ? Macnee makes no mistake. The waistcoat might be just a little too long, but it’s supposed to show beneath the button. That’s how it is on the pre-war photographs and illustrations I’ve seen. It will show more than Q’s waistcoat since single-breasted waistcoats are longer than double-breasted waistcoats. More waistcoat also shows because the link fastening means that less of the waistcoat is covered by the coat. I believe Prince Charles does indeed pay for his clothes. It’s not like he can’t afford them. Surely the British taxpayer pays for them, Matt, albeit indirectly? 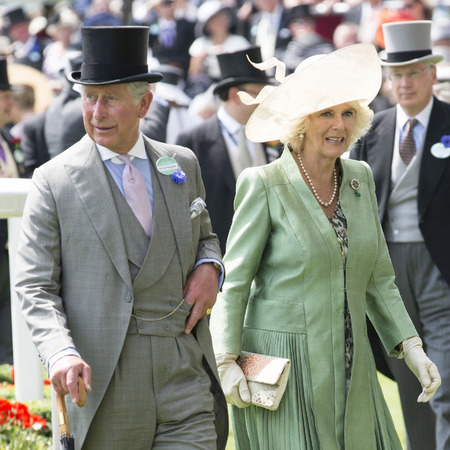 Apparently some Royal Ascot attendees favour a black top hat because it is less likely to be suspected of being hired (grey top hats with black bands are apparently the common hire model). Charles does seem always to dress correctly, but I must say I don’t care for his double-breasted suits particularly. In a way it’s admirable that he continues to wear them when so few other men do, and it’s good that he has his own style and isn’t afraid to stick to it, but it would show some flexibility to wear a single-breasted jacket now and then. He looks a bit like a museum piece at times.